Remove kale stems and chop kale finely. Place in a large bowl. Chop garlic finely. In a small bowl, add garlic, olive oil, lemon juice, tahini (optional), and salt to taste. 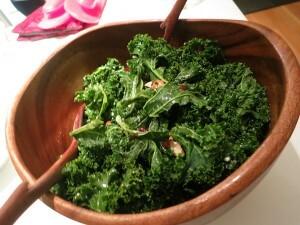 Pour dressing over kale and toss well. Let salad sit for at least 5 minutes. Note- You can easily substitute these ingredients for similar ingredients available.